LA-GETTING THERE FROM HERE-A few years ago, the satirical publication, The Onion ran an article under the headline "98 Percent of US Commuters Favor Public Transit for Others." The spoof cited a mythical press release by the American Public Transit Association (APTA), in which Lance Holland of Anaheim, California said "Expanding mass transit isn't just a good idea, it's a necessity," Holland said. "My drive to work is unbelievable. I spend more than two hours stuck in 12 lanes of traffic. It's about time somebody did something to get some of these other cars off the road." The Onion spoof said that APTA would be kicking off a new promotional campaign using the slogan "Take the Bus... I'll be Glad You Did." The Onion spoof singled out Los Angeles County Metropolitan Transportation Authority (MTA) officials as saying that public support for mass transit will lead to its expansion and improvement." 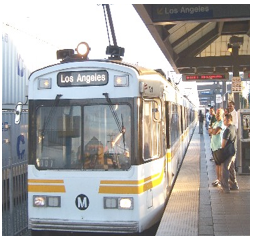 "Transit for Others" characterizes three decades of transit in Los Angeles County. Despite its massive $10 billion rail program. 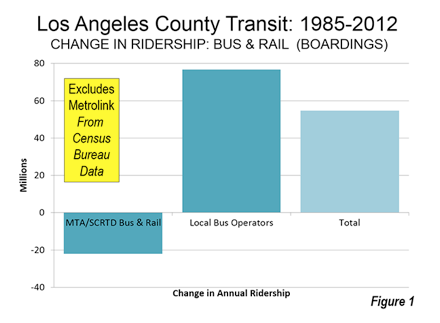 MTA bus and rail services carried fewer riders in 2012 (latest Federal Transit Administration data) than were carried by the buses in 1985 (MTA was formed in the early 1990s from a merger between the Los Angeles County Transportation Commission and the Southern California Rapid Transit District). The Birth of Modern Rail-The history of the modern Los Angeles rail revival began with a special meeting of the Los Angeles County Transportation Commission on August 20, 1980. I was to play a principal role. The original motion by Supervisor Hahn was amended by Gardena Mayor Edmund Rusk, who proposed a "local return program," which would dedicate 25 percent of the funding to municipalities (and Los Angeles County for unincorporated areas) on a population basis, to be used for transit services. At that time, local operators provided less than 20% of the bus service, with the overwhelming majority of services provided by the Southern California Rapid Transit District (SCRTD). Transit Since Proposition A-The impacts of the three programs approved in 1980 had varying results on transit in Los Angeles. Local Return Program: Since 1985, when the bus fare reduction program ended, by far the greatest impact on ridership was from the Local Return program. In 1985, the existing local bus operators carried approximately 55 million annual passengers, a figure that rose to more than 130 million in 2012 (a nearly 40 percent increase). This ridership increase is more passengers that were carried on all the bus and rail systems of Dallas (DART), Salt Lake City and St. Louis in 2012, according to Federal Transit Administration data.